Misconceptions about how to lose weight abound, especially on the Internet. Get the facts on shedding pounds now: Start by dispelling these 30 commonly held — but wholly inaccurate — notions. Myth 1: Some foods speed up your metabolism. Metabolism describes all the chemical processes that go on continuously inside the body to keep you alive and your organs functioning normally, such as breathing, repairing cells and digesting food. These processes need energy and the amount of energy required varies between individuals depending on factors such as body size, age, gender and genes. It is claimed that certain foods and drinks can increase your metabolism by helping the body to burn more calories and aid weight loss. There is little scientific evidence for this. Beware that some of these products may contain high levels of caffeine and sugar. To lose weight you need to burn more calories than you consume. Myth 2: All slimming pills are safe to use for weight loss. Myth 3: Fad diets will help me lose weight and keep it off. Myth 4: Grain products such as bread, pasta, and rice are fattening. I should avoid them when trying to lose weight. Myth 5: Some people can eat whatever they want and still lose weight. Myth 6: "Low-fat" or "fat-free" means no calories. Myth 7: Set a Realistic Goal Weight—Or Else You'll Be Totally Discouraged. It sounds reasonable, but there's no evidence to back it up: Feeling frustrated about a seemingly difficult-to-achieve weight isn't going to preclude you from hitting your goal. Myth 8: Fast foods are always an unhealthy choice. You should not eat them when dieting. TIP: Many fast foods are unhealthy and may affect weight gain. However, if you do eat fast food, choose menu options with care. Both at home and away, choose healthy foods that are nutrient rich, low in calories, and small in portion size. Avoid "value" combo meals, which tend to have more calories than you need in one meal. Myth 9: If I skip meals, I can lose weight. Myth 10: Eating healthy food costs too much. Myth 11: Lifting weights is not a good way to lose weight because it will make me "bulk up." Myth 12: Physical activity only counts if I can do it for long periods of time. You've heard it a million times: If you lose weight super quickly, it'll be hard to keep that weight off in the long-run, compared to losing weight slowly and steadily. Turns out there's not much research to support this, and that weight-loss retention is a lot more complicated than the speed at which you drop the pounds at the outset. Myth 14: Eating meat is bad for my health and makes it harder to lose weight. Myth 15: Dairy products are fattening and unhealthy. Myth 16: "Going vegetarian" will help me lose weight and be healthier. Myth 18: Genes Aren't a Factor in the Obesity Epidemic. While you'd love to inherit your mom's smarts, smile, and sense of style, her slow metabolism and tendency to crash diet are traits you'd probably rather pass on. Myth 19: A radical exercise regime is the only way to lose weight. Myth 20: Starving myself is the best way to lose weight. Myth 21: Cutting out all snacks can help you lose weight. Snacking isn't the problem when trying to lose weight: it's the type of snack. Many people need a snack in-between meals to maintain energy levels, especially if they have an active lifestyle. Choose fruit or vegetables instead of crisps, chocolate and other snacks that are high in sugar, salt and fat. Myth 22: Drinking water helps you lose weight. Water does not cause you to lose weight, but it does keep you hydrated and might help you snack less. Water is essential for good health and well being. Sometimes thirst can be mistaken for hunger – if you're thirsty you may snack more. Myth 23: There are some magical foods that cause weight loss. Myth 24: Drinking while you are eating is fattening. 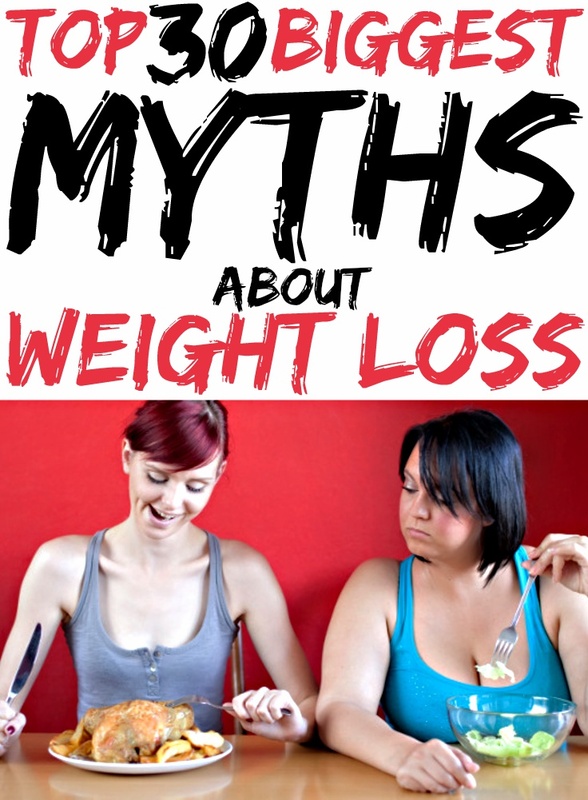 Myth 25: Losing Weight is a Linear Process. Losing weight is usually not a linear process, like some people think. Some days and weeks you may lose, while during others you may gain a little bit. Losing weight can take a long time. The process is generally not completely linear, as weight tends to fluctuate up and down by a few pounds. Myth 26: “Eat Less, Move More” is Good Advice. Myth 27: Fat Makes You Fat. Fat has often been blamed for the obesity epidemic, but there is nothing inherently fattening about dietary fat. It depends entirely on the context. Myth 28: Eating Breakfast is Necessary to Lose Weight. Myth 29: People With Obesity Are Unhealthy, Thin People are Healthy. It is true that obesity is associated with an increased risk of several chronic diseases. This includes type 2 diabetes, heart disease, increased risk of some cancers, and others. It seems to matter where the fat builds up. If you have a lot of fat in the abdominal area, around the organs, then this type of fat is much more strongly associated with metabolic disease. The fat that builds up under the skin, the subcutaneous fat, is more of a cosmetic problem. Obesity is linked to several chronic diseases, such as type 2 diabetes. However, many people with obesity are metabolically healthy, and many thin people are not. Myth 30: Frozen fruits and vegetables are less nutritious than fresh ones.